As a CAT Footwear spokesman and the producer, creator and host of “Dirty Jobs”, Mike Rowe knows exactly what a durable yet comfortable pair of work boots or shoes should feel like. 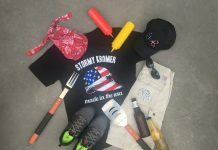 That is why Mike Rowe and CAT Footwear created a signature series of work boots and rugged casual shoes entitled “Mike Rowe Works” by CAT Footwear. 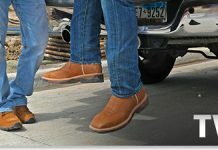 When this line is released in Spring 2012 it will be offered on WorkingPerson.com by Working Person’s Store. As a CAT Footwear spokesman and the producer, creator and host of “Dirty Jobs”, Mike Rowe knows exactly what a durable yet comfortable pair of work boots or shoes should feel like. The safety footwear designed for the Mike Rowe Works line is tough enough to stand up to the unique challenges some American workers face on an average day. 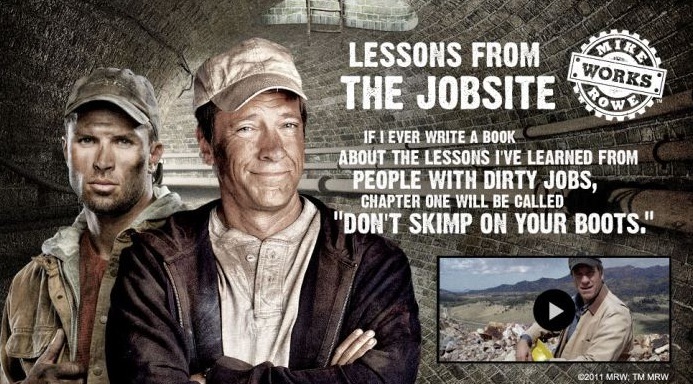 As the host of Dirty jobs, Mike Rowe has all the experience you need for getting rough, tough and dirty on the job. Without his work boots he would not be able to make it through. So, when his own boots started looking a little shabby on the job, CAT Footwear noticed and reached out to him to help create a line that can stand up to the roughest jobs, and to replace his own work boots. Rowe states, “CAT saw me on TV and took pity”. From that point on a partnership was developed. The relationship between Rowe and CAT Footwear is a harmonic synthesis of the same quality and ideals that the working person stands for. Besides being a television host and trade activist, as evidenced by his site “MikeRoweWorks.Com”, Mike Rowe also once sang opera. Many people know Mike Rowe from his work on not only Dirty Jobs, but also his voice over work with “Deadliest Catch”. His partnerships with Ford have also brought him to the forefront of the American eye. He is one of the most trusted celebrities on television and many millions of people watch him every single week. His heart and soul are for America’s hard-working men and women. He is the perfect match for the partnership with CAT Footwear. The combination of a tough brand of footwear with a tough working man makes Mike Rowe Works an instant success. Working Person’s Store knows a thing or two about safety footwear fit for the working person, so when the opportunity arose to carry the Mike Rowe Works line, they took it. The shoe line will premier at Working Person’s Store and on their website, WorkingPerson.com in Spring of 2012 and costs will average between $100-$130 dollars. You can expect to see the same durability, comfort and protection in this line as CAT puts into all their lines of safety boots and shoes. The work boots in this line are based upon a classic CAT style of high quality footwear with a rugged and casual design for comfort. Working Person’s Store will offer a variety of 6 and 8 inch steel toe boots in both black and brown. Solid construction makes these work boots the perfect fit and since they are designed by CAT, you can count on them holding up to whatever the workday holds while keeping feet safe, warm and dry. 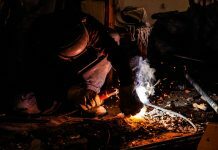 Previous articleWhy Wear Safety Footwear?